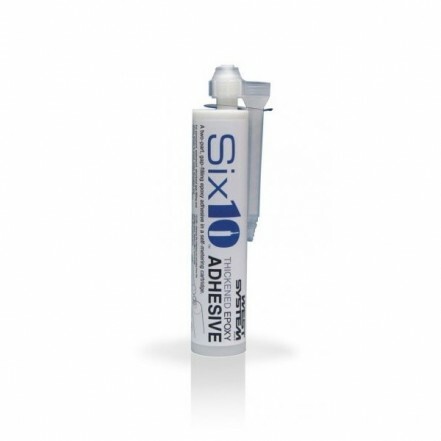 Six10 Thickened Epoxy Adhesive combines the strength and reliability of a two-part WEST SYSTEM Brand Epoxy with point-and-shoot convenience. The self-metering coaxial cartridge dispenses a gap-filling structural epoxy that bonds tenaciously to wood, metals, fibreglass and concrete. The tube comes with a static mixer that lets you lay down a bead of thickened epoxy with any standard caulking gun. Six10&apos;s shear thinning properties make it "thinner" as it&apos;s worked. It can be easily tooled into a non-sagging fillet or used to wet out light to moderate reinforcing fabrics like fibreglass. The hardener provides a long open time but has fast through-cure. Six10 stays workable in the static mixer for 42 minutes, making it practical for long or complicated assemblies.